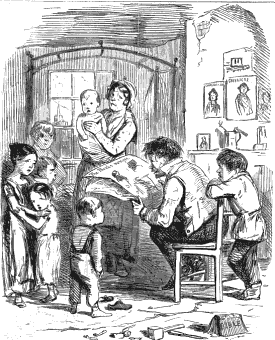 Cassell's Illustrated Family Paper (London). Fair Rosamond, An Historical Romance . London: William Barth, 1844. 41 nos. 516 p.
The London Apprentice and the Goldsmith's Daughter of West Chepe; or, the evil May-day. A story in the times of bluff King Hal . Vol. 1. London: W. S. Johnson, . 31 nos. 244 p.
The London Apprentice and the Goldsmith's Daughter of West Chepe; or, the evil May-day. A story in the times of bluff King Hal . Vol. 2. London: W. S. Johnson. 31 nos. 248 p.
The London Apprentice and the Goldsmith's Daughter of West Chepe; or, the evil May-day. A story in the times of bluff King Hal . Vol. 3. London: W. S. Johnson. 29 nos. 230 p.
Pierce Egan the younger. Harry Racket Scapegrace, the spoiled child. A tale for the wilful . London: W. Barth. 102 p.
M. G. Lewis. The Bravo of Venice: a romance . London: G. Berger, 1839. 5 nos. 80 p.
Paul Feval. The Loves of Paris, a romance . London: G. Vickers, 1846. 21 nos. 171 p.
The Novel Newspaper . Vol. 4. The Novel Newspaper . Vol. 5. The Novel Newspaper . Vol. 6. George Sand. The Sin of M. Antoine . "Roscoe's library edition". London: E. Appleyard. 27 nos. 210 p.
Eugene Sue. Therese Dunoyer; or, the manor house of Treff-Hartlog. A romantic tale . London: , 1845. 14 nos. 114 p.
Henry Cockton , Esq. The Love Match . London: W. M. Clark, 1849. 24 nos. 373 p.
London: W. M. Clark, . 24 nos. 373 p.
The Steward: a romance of real life . London: W. M. Clark, 1851. 24 nos. 380 p.
Henry Villiers. The Stranger's Grave . London: [G. Vickers], 1842. 23 nos. 282 p.
The Farmer of Inglewood Forest . London: John Lofts. 384 p.
George W. M. Reynolds , Esq. Pickwick Abroad; or, the tour in France . London: Willoughby & Co. 80 nos. 628 p.